Don’t you hate it when you ask for a high-chair at a cafe or restaurant and you’re presented with a not-so-clean version? You feel obliged to use it since you asked for it but all the while you’re cursing yourself for not having a chair of your own that’s easy to tote around. Good news Babyologists, with the Lobster, you can! Phil & Teds deliver exactly what parents want with the Lobster, their compact and clip-on highchair. We love it because it weighs only 1.8 kilograms, so there’s no risk of shoulder injury by carrying it for extended periods of time. 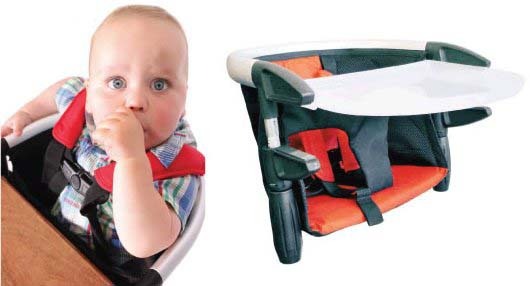 The Lobster even folds up small enough that you can keep it in the bottom of your pram, leaving you prepared to stop for a coffee any time, anywhere. 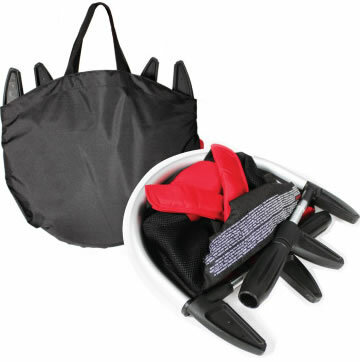 The Lobster is a stylish, improved version of the much loved Metoo chair and clips on to just about any table top, bringing your baby closer to the action, making it much easier to interact with the rest of the family. The Lobster holds a maximum weight of seventeen kilograms and fits children aged from six months up to three years. A five-point safety harness ensures there’s no escaping and fast deploy handles means departures are quick, without any embarrassing crawling under tables to unscrew clamps. Babyology loves great highchairs so be sure to check out our Chooser to help make your decision a little easier. The Lobster is available for US$79.99 from Phil & Teds. A reshipper will be required to ship from the US but we hope to see the Lobster available locally soon!